Download our detailed flier, as well as your application and ​​​participant agreement, and contact us at triniyogatt@gmail.com with any questions you might have! If you've ever dreamed of teaching yoga, this is a once-in-a-lifetime opportunity for you!! 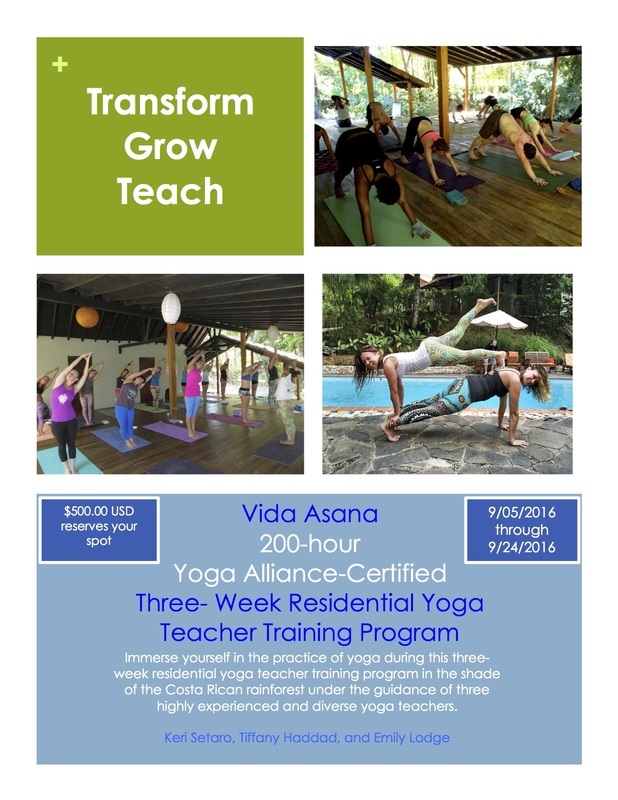 Join me, Keri Setaro, and Emily Lodge for this three-week, 200-hour Yoga Alliance-certified teacher training program at Vida Asana, one of the first yoga retreat centers on the Pacific coast of Costa Rica. Full tuition - including three weeks of training, lodging and meals, and round-trip ground transportation between San Jose Airport (SJO) and Vida Asana - is $4,500, with an early bird discounted rate of $4,000 for all deposits received before June 15, 2016. Don't wait - submit your application, participant agreement, and $500.00 USD deposit (plus credit card transaction fee) and reserve your spot today! Has your application been accepted? Click here to make your deposit today!